A minority of remainers don’t want it though and no leave voters want it. That’s a majority in favour of not having another vote. Case closed. Direct from the horse's mouth on what the recent YouGov polls indicate. Although they are only indications and other polls are available. It very much depend on the question where no deal stands. But in terms of preference, it doesn't stack up well against 2nd referendum. 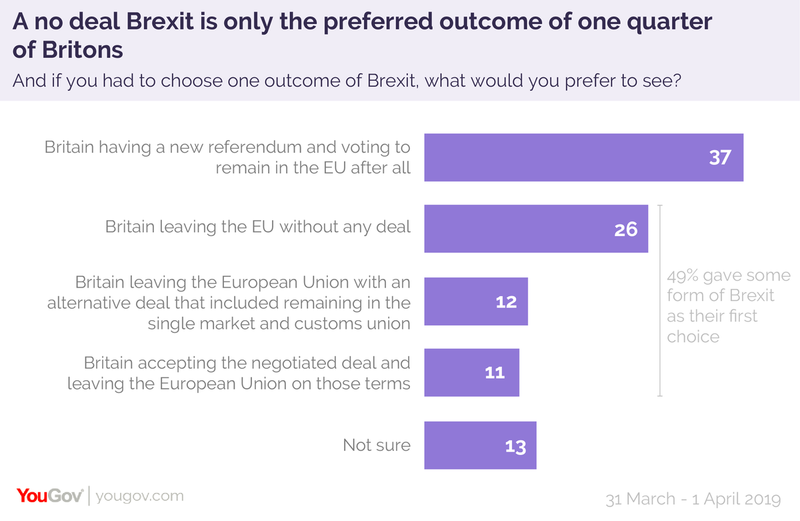 I'm gobsmacked that even a quarter of those polled would prefer to see no deal though. Weird times. They should have respected the vote in 2016 and left the EU. Then when the next elections came round then the remainers could then appeal for another referendum, get a reserve UKIP party going. ....and rejoin on worse terms than we currently have. That means accepting "Ever closer union", "schengen", lose our rebate, and join the euro. All the while spending a couple of years with self imposed sanctions scrapping around for trade deals whilst our home grown industries erode away. Great plan that. Key for me is this one that asks what you'd like to see happen if we had to leave now. 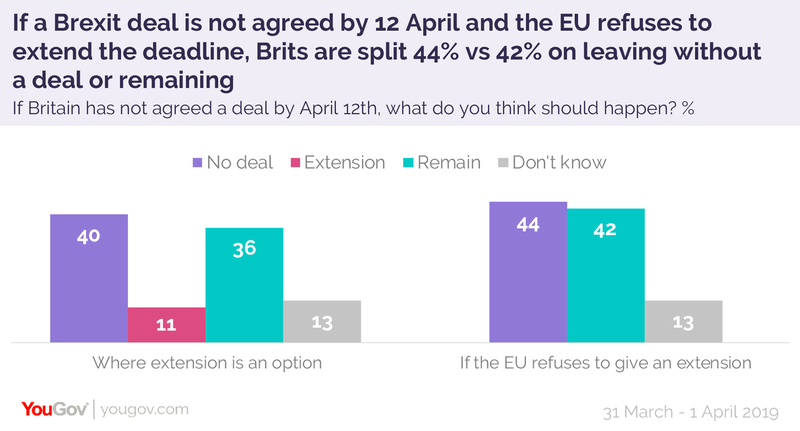 The majority would prefer no deal over any other option (extension or remain). Given what we know about the impact of a no deal, I find this absolutely bonkers. The hard liners promo campaign has worked a treat (again). An admission that we do have a big say in the EU after all. The UK has a veto? What a pathetic little prat he is. Macron will take zero notice of his nonsense anyway. The big move is that for the first time we’ve now committed to holding EU elections (which is just a decision in privy council apparently). Big psychological barrier two. One was moving initial leave date. Second EU elections. After that, it’s all much easier to kick can down the road. It’s interesting how quickly this notion of a ‘flextension’ just becomes accepted. Tusk talking about it means he has spoken to the EU27 and has support. We put in a letter committing to EU elections and embracing a flextension as well (albeit with a stupid date which will be changed). Uk foreign policy for the last 500 years. I imagine Macron has more pressing issues on his agenda than the twitter prattlings of a bespectacled stick insect. He should focus on getting his own house in order. Plus JRM has reached a level of stupidity that sees him destroy his arguments that we have no say in EU affairs and we are simply a taker of rules in one petulant little tweet. I’ll add him to the “to be sacked” list forthwith. Wouldn’t it be easier to have a ‘should not be sacked’ list? Be the same length as ‘players that will not be sold if we receive an offer of £100 or above’. Needs a long hot bath with nanny scrubbing all the hard to reach bits. I’ll put my hand up for that option, High. Think Faye Dunaway in Little Big Man ... Cor! Every time he has a lie down, nine months later out pops another Rees-Mogg. Fecund. That’s the forum’s word for the day, mate. I think a few of us saw that he had zero integrity very early on. Glad that others are catching up. He knows the Classics and can quote Horace without breaking stride. Do that and I’m usually oblivious to all else. His eyes don’t sparkle like Lisa’s, though. She wins.